Featuring over fifty works from public and private collections, the exhibition spans Jean-Michel Basquiat’s brief but meteoric career, which ended with his death at the age of twenty-seven. 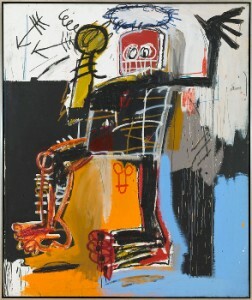 Thirty years after Larry Gagosian first presented his work in Los Angeles, twenty years after the first posthumous survey at the Whitney Museum of American Art (1992–93), and eight years after the Brooklyn Museum of Art retrospective (2005), viewers will have a fresh opportunity to consider Basquiat’s central role in his artistic generation as a lightning rod and a bridge between cultures. If you’ve got a craving for barbeque, check out Brother Jimmy’s Bait Shack as the ribs, chicken, beef, and pork are all smothered in some amazing BBQ sauce. BB&R, which stands for Blonde, Brunette, and a Redhead is the brainchild of three best friends. What they’ve created is something between a neighborhood bar and a lounge with leather seats in the front and a pool table, photo booth, and video games in the back. Looking more like it came out of Willie Wonka and the Chocolate Factory, Dylan’s Candy Bar is a colorful place to get lollipops, licorice, and all things sugary. Don’t go crazy or your sweet tooth might melt here!